Those who have been paying attention to processor evolution should remember the decision by Intel to migrate from Socket-7 to Slot-1 a couple years ago when they released the Pentium II. Before that, their processors had been based on socketed designs for several generations, and the change to slot implementation was no doubt a big change for Intel. Intel had their reasons in doing so, mainly because they wanted to move the cache closer to the processor core without actually integrating it in the same package (ala the Pentium Pro). Therefore they had to change to a slot design, where they would be able to include the L2 cache external to the die but still on the same PCB. Slot-1 looked to be the way of the future for Intel CPU's. 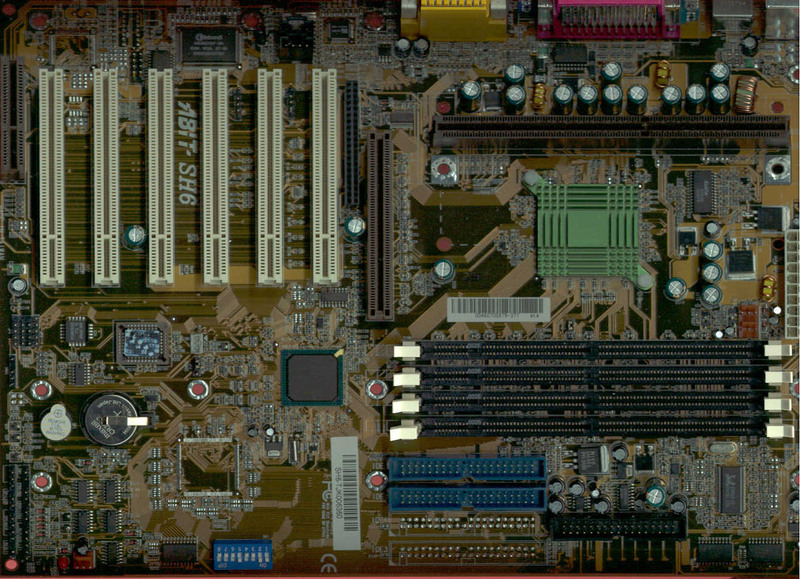 Unfortunately for those users who bought Slot-1 motherboards with those thoughts in mind, the advent of on-die L2 cache with the Celeron and Coppermine CPU's signaled a move back to socketed designs due to their lower manufacturing costs.For those who had bought a Slot-1 motherboard and CPU that meant they would not be able to upgrade anymore without getting a new motherboard and CPU. Things were not as bad, since manufacturers immediately came up with Slotkets, which allows users to use Socket-370 processors on Slot-1 motherboards. Unfortunately, those with Slot-1 CPUs would not be able to upgrade to newer chipsets and/or motherboards without getting a new processor once Slot-1 motherboard designs were phased out. It didn't take long for that to happen - up until now, all i815(E) boards were Socket-370 based. Here's where ABIT comes into play with the SH6, an Intel i815E motherboard with Slot-1 implementation. In terms of the design, the SH6 is very similar to the SA6R, Since ABIT had to redesign CPU section of the board, the question remains of whether or not they can maintain the same level of stability and performance. Read on to find out if this board can serve as a bridge between your Slot-1 CPU and your next Socket processor. Just like the ABIT SA6R, the SH6 is using quite a hefty PCB - about 12 by 9.5 inches. We will talk more about the reasons for this later on, but for now you can see that there are traces all over the place, so ABIT is not wasting any PCB space at all. The general layout of the board is excellent. ABIT is always known as a manufacturer focused on hardware enthusiasts, and the SH6 is definitely another indication of ABIT's excellent work. The area around the CPU slot is clean without any major obstacles or connectors. The power supply connector, just like other recent ABIT motherboards, is located on the right edge of the motherboard, so the power supply cables will not have to run over the CPU. The DIMM slots are located around 3.5 inches from the CPU slot, so you should have no problem using larger HSF units. The IDE connectors and the floppy connectors are located in the front of the DIMM slots, allowing all but one PCI slot to be full length. As you can see from the following pictures, when the motherboard and CPU are installed into the case, there is a lot of space around the processor (notice that the cables are not even carefully bundled here) so that the HSF can effectively cool down the processor. All the major cables, including the power supply cables, IDE and floppy cables, are packed on the front of the motherboard, so they will not block the expansion cards on the left.